This quaint town is just over 200 km from Hyderabad but can be accessed from Kurnool 27 km too. It is well known for its temples of the Chalukyan era and two sets of temples with Brahmeswara and Papanatha as presiding deities stand on the banks of the River Tungabhadra with Alampur town in between. 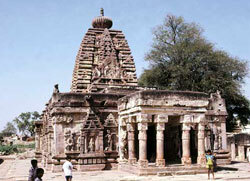 It is a haven for the tourist with an archaeological bent of mind and the interest is enhanced by the fact that in these parts the Archaeological Survey of India took apart temples stone by stone and relocated them elsewhere to ensure that they are not submerged by irrigation projects taken up in the area. The nearest city is Kurnool on the Hyderabad-Bangalore National Highway 27 km and the nearest airport is Hyderabad 200 km. This entry was posted in Alampur, Andhra Pradesh. Bookmark the permalink.